An earlier portrait of His Highness the Aga Khan. 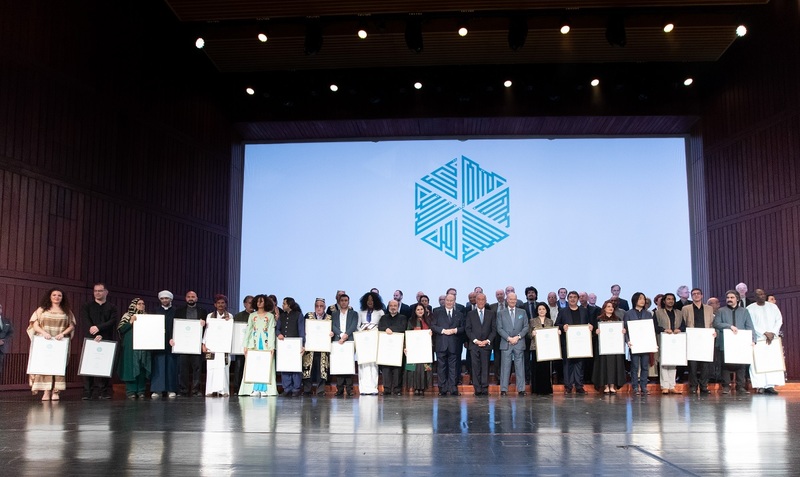 To date, His Highness the Aga Khan, the 49th Imam of Shia Imami Ismaili Muslims, has been awarded 20 honorary degrees by universities from 11 different countries. The latest, the 20th, was conferred at 11 a.m. on Friday January 13, 2012, by the University of Ottawa, Canada. 1. Canada – from five institutions of the prestigious “G13.” G13 or Group of 13, is a group of leading research-intensive universities in Canada: McGill University, McMaster University, University of Toronto, University of Alberta, University of Ottawa. 2. UK – from three institutions of the prestigious “Russel Group.” The Russell Group is a collaboration of the top twenty universities in the United Kingdom: University of London, University of Wales, University of Cambridge. NOTE: Legum Doctor (LL.D. also known as Doctor of Laws) is a doctorate-level academic degree in law, or an honorary doctorate, depending on the jurisdiction. November 30, 1967: His Highness the Aga Khan - "The day we no longer have the time nor the faith to bow in prayer to Allah because the human soul...is no longer of sufficient importance to us will be a sunless day of despair." “I am deeply moved by the kindness of your welcome and by the outstanding honour this University has done in bestowing an honorary degree upon me today. I speak these words in no formal sense, but from the heart. I do this especially because, as a Muslim it will remain a proud memory that the first such academic honour I have received has been given to me by this renowned Islamic seat of learning in Pakistan. “…..What has been called the permissive society where anything goes, nothing matters, nothing is sacred or private any more, is not a promising foundation for a brave and upright new world. This fearful chase after material ease must surely be tempered by peace of mind, by conscience, by moral values, which must be resuscitated. If not, man will simply have converted the animal instinct of feeding himself before others and even at the expense of others, into perhaps a more barbaric instinct of feeding himself and then hoarding all he can at the cost of the poor, the sick and the hungry. “….It is here that the East, that Asia, nay that this very University can contribute something of primordial and everlasting value. It is my deepest conviction that if Islamic society is to avoid following blindly the course of Western society without taking the trouble to raise guards against the latter’s weaknesses and deficiencies, a thorough rediscovery, revitalisation and reintegration of our traditional values must be achieved. “It would be traumatic if those pillars of the Islamic way of life, social justice, equality, humility and generosity, enjoined upon us all, were to lose their force or wide application in our young society. It must never be said generations hence that in our greed for the material good of the rich West we have forsaken our responsibilities to the poor, to the orphans, to the traveller, to the single woman. “The day, we no longer know how, nor have the time nor the faith to bow in prayer to Allah because the human soul that He has told us is eternal is no longer of sufficient importance to us to be worthy of an hour of our daily working, profit-seeking time, will be a sunless day of despair. “It is eminent seats of learning such as this that can synthesise and transmit to the younger generations the proper balance between the Western search of well-being and the Eastern spiritual, human and cultural traditions. I believe the future does reserve better standards of living for us than what we have at present, but in order to enjoy them fully, we must know today what will be the fundamental principles of our lives tomorrow. “I render sincere and high tribute to Peshawar University that has set out to fulfil this essential and monumental task. 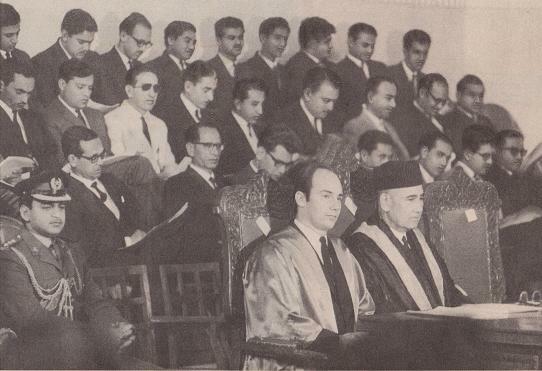 His Highness the Aga Khan was awarded an Honorary Doctorate of Law by Sind University, Karachi “in recognition of the role that his Royal Highness and his ancestors have played in the world of Islam, of his patronage of arts, education and learning, and in recognition of his love, sympathy, condescension and affability, his humanity and his generosity,” and other contributions. “Pakistan was conceived by Muslims and for Islam. Everyone here will agree with me, I am sure, that the source of national motivation in the future must continue to be our faith. But once this is said, how is it to be achieved? If institutions are born from society, then I affirm that it is to our society that we must turn, and ask ourselves: If Islam is to be the source of inspiration, how do we transform this inspiration into practical terms of everyday life? And how do we do this and at the same time continue to make material progress? These questions have a special urgency and relevance in a democratic society such as Pakistan is now seeking to create. It is society which gives birth to its institutions in democracy – and not the institutions which shape and impose themselves upon society. “I am convinced that our faith and our heritage contain all the indicators that we shall need. More than this, I am convinced that it will take relatively little effort to isolate those elements which, through the centuries, were responsible for the amazing development of the Muslim Empire. And once we have identified these basic elements, we should be able, without difficulty, to use them to our advantage. “…Let me turn to another aspect of Islamic society: our intellectual elite. In the past, much of the dynamism of Muslim society was born from the leaders of the faith: the Imams, the Pirs and Mullahs. This identity between the leaders of the faith and the empire’s intellectual elite was a continuous source of strength both to the faith and those whose duty it was to govern the empire. How many aspiring Mullahs or Imams today enter secular universities and obtain degrees in secular subjects? And vice-versa, how many university graduates, after completing their degrees, turn their lives to directing the flock of the faithful? Let me not be misunderstood – I criticise neither Pirs nor Mullahs nor Imams nor degree-holders. I simply state that in future I believe it will be in our society’s interest to have a much wider platform in common between our religious and our secular leaders. Our religious leadership must be acutely aware of secular trends, including those generated by this age of science and technology. Equally, our academic or secular elite must be deeply aware of Muslim history, of the scale and depth of leadership exercised by the Islamic empire of the past in all fields. “It is through the creation of such a new elite, inspired by, and widely read in everything related to our heritage, that there must come about a revival in Muslim thought. 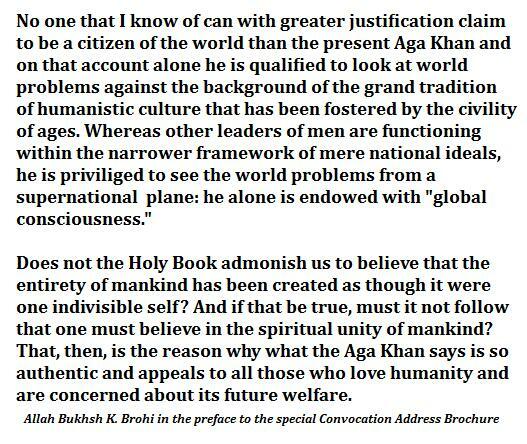 “The Aga Khan’s personal position is unique in the world today….This man is a bridge between North and South, East and West. His leadership is beyond politics, beyond race, beyond religion. May 15, 1987: Minister of Colleges and Universities, the Hon. Gregory Sorbara, conveys greetings from the Province of Ontario at the McMaster University's Convocation while Dr. Lee, the Aga Khan, The Chancellor Dr. Panabaker and the Lt. Governor, The Hon. Lincoln Alexander look on. Photo credit: Nadir Abdulla (Ontario Ismaili, 7/1987). 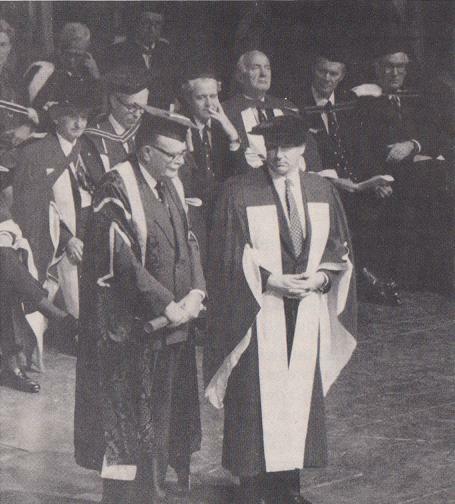 May 15, 1987: His Highness the Aga Khan being conferred an honorary degree of laws by McMaster University on its 100th anniversary for his leadership in the advancement of health and education in a large number of developing countries. 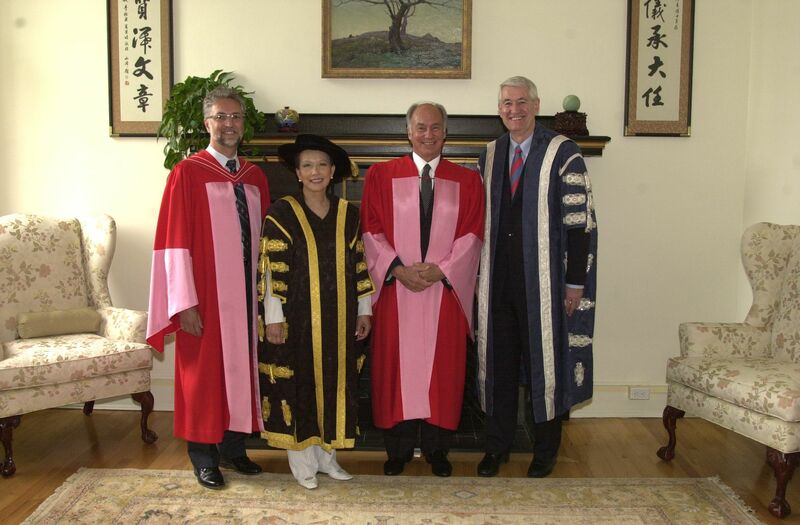 The President of the University, Mr. Alvin Lee, praised His Highness the Aga Khan’s “sober and responsible leadership in the advancement of the Third World; his promotion of education and the ideal of education; his major contribution to health care in Pakistan and his involvement of McMaster University in that project; and his extraordinary efforts in bridging many and very diverse religions and cultures … for which, he is unique in bridging the underdeveloped and the highly developed worlds. Her Royal Highness, Princess Anne, Chancellor of the University, conferred the Degree during the Founders Day Convocation ceremony. 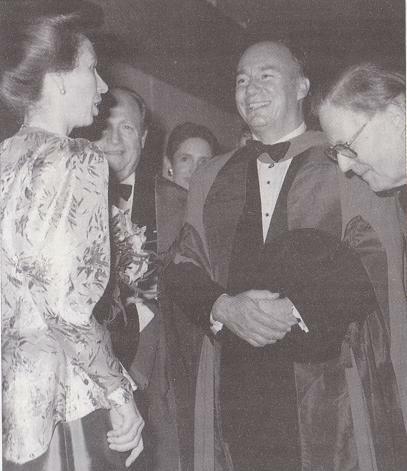 October 11, 1989: His Highness the Aga Khan with Princess Anne, Chancellor of the University of London at a ceremony at Logan Hall where he received an Honorary Degree of Doctor of Literature in Education from the University of London. 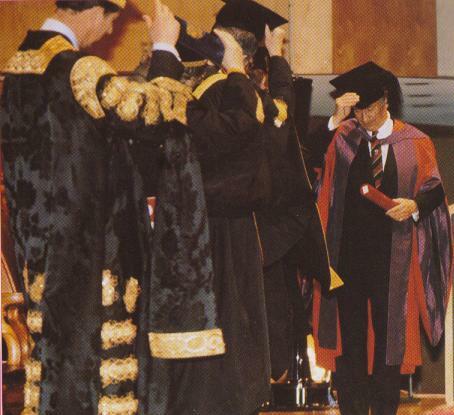 November 30, 1993: His Highness the Aga Khan, Prince Charles, Chancellor of the University of Wales and other members of the procession '"doff" their caps following the award of the honorary degree of Doctor of Laws to the Ismaili Imam on the 100th anniversary of the founding of the university. Prince of Wales, Princess Charles, Chancellor of the University, conferred the Degree to His Highness the Aga Khan for his patronage of education and academic research throughout the world. 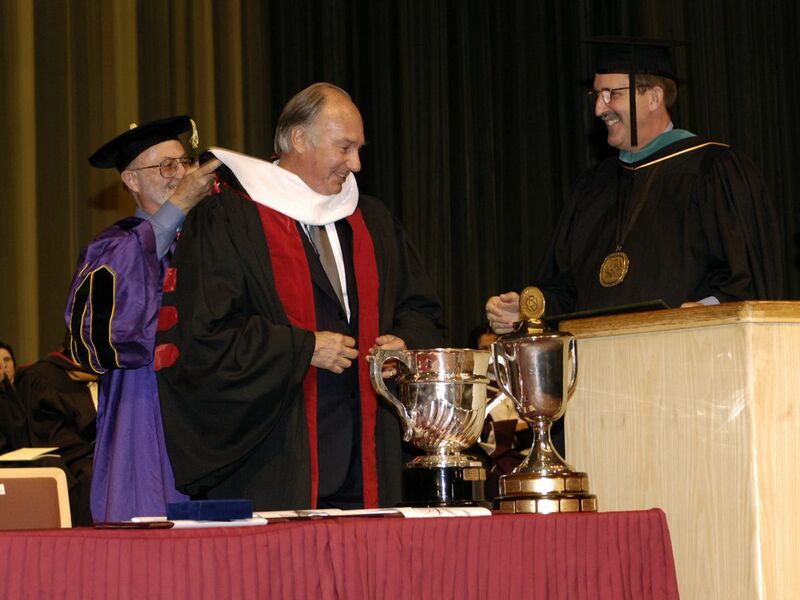 His Highness the Aga Khan was the first graduator of the University which was founded on August 5, 1992 by the decision of the Cabinet of the Ministers of the Rupublic of Tajikistan. 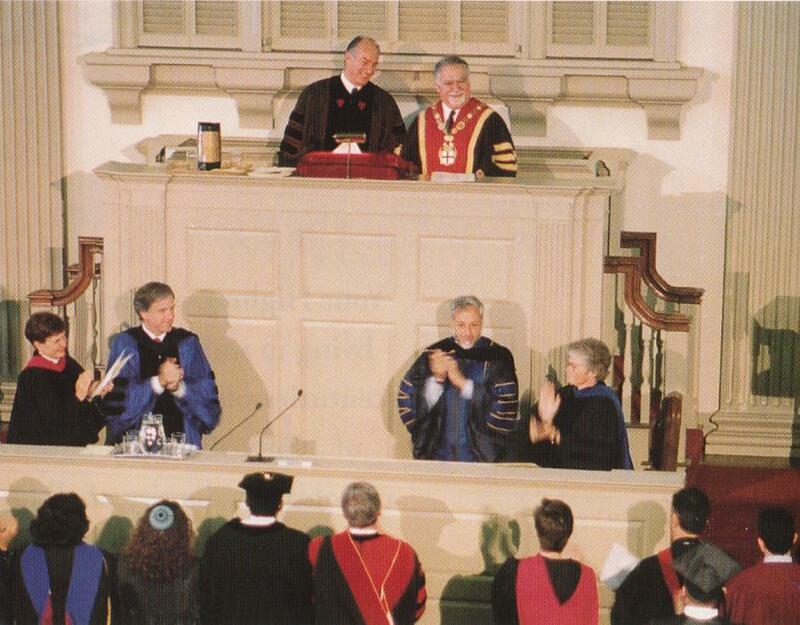 May 26, 1996: His Highness the Aga Khan receives a standing ovation at the conclusion of the Baccalaureate Address at Brown University, Providence, Rhode Island. “He has become a major activist for civilized humanity and universal values. Not in words but in deeds. Not in one location but around the world. “He then turned down the visor and showed me the Aga Khan’s picture. Your Highness, I told him that when I see you, I will thank you on behalf of Fateh Ali Jindhani and all the Fateh Ali Jindhanis of the world. They are a legion and they are of all faiths. “As an educator, I thank you on behalf of universities where no Islamic Civilization was taught and where, thanks to your munificence such teaching now exists. 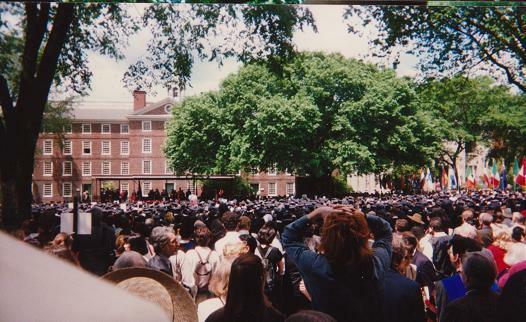 “One more private, personal thank you — for entrusting the education of Prince Rahim to Brown University. We are grateful for your trust, we salute Prince Rahim, your beloved daughter Princess Zahra and your son Prince Hussain. “For the last fifty years, our planet has been frozen by a paralysing bipolar political vortex which we call the Cold War. During those years, many allowed their views to stagnate and harden into notions so dependable that they became unrevisable dogmas: My capitalism versus your communism, your eastern bloc versus our western bloc and left versus right. But like the Berlin Wall, our old bipolar system was dismantled almost overnight, and with it the black and white world to which we had grown accustomed. Unfortunately, views and thought habits, although intangible, are less easily broken than bricks and politics. Learned human behaviour dies hard. “….Today in the occident, the Muslim world is deeply misunderstood by most. The West knows little about its diversity, about the religion or the principles which unite it, about its brilliant past or its recent trajectory through history. The Muslim world is noted in the West, North America and Europe, more for the violence of certain minorities than for the peacefulness of its faith and the vast majority of its people. The words “Muslim” and “Islam” have themselves come to conjure the image of anger and lawlessness in the collective consciousness of most western cultures. And the Muslim world has, consequently, become something that the West may not want to think about, does not understand, and will associate with only when it is inevitable. The honorary rank of professor of the Osh State University was conferred on His Highness Aga Khan for his long and faithful engagement in the sphere of social development and education in Kyrgyzstan and Central Asia. We are now emerging into an age when different civilisations will have to learn to live side by side in peaceful interchange, learning from each other, studying each other’s history and ideals, art and culture, mutually enriching each other’s lives. The only alternative in this overcrowded little world, is misunderstanding, tension, clash, and catastrophe. “The prescient writer, whom some of you will recognise as a distinguished alumnus and former teacher at this great institution, went on to lead this country as its fourteenth Prime Minister: Lester B. Pearson. “…..This is the nature of the true regime change we need, where the civil society of the industrialised world gives wide and encompassing support to that of the developing world. “True regime change occurs when liberty is guaranteed by a people free to create or support institutions of their own choosing. True regime change occurs when that strength and that freedom are defined by the depth, breadth and quality of education shared across the society in question. “Partnerships between the developed and developing worlds can and do work. Moreover, they demonstrate how essential universities and their lifeblood – you their graduates – are to civil society. “….Today, you are graduating from one of Canada’s greatest universities in a field of study that is of paramount importance. I am speaking to you as a person whose roots and institutional engagement are in the developing world; as a Muslim; as someone seeking to engage with, and improve, the lives of the millions of people who live in Asia and Africa. 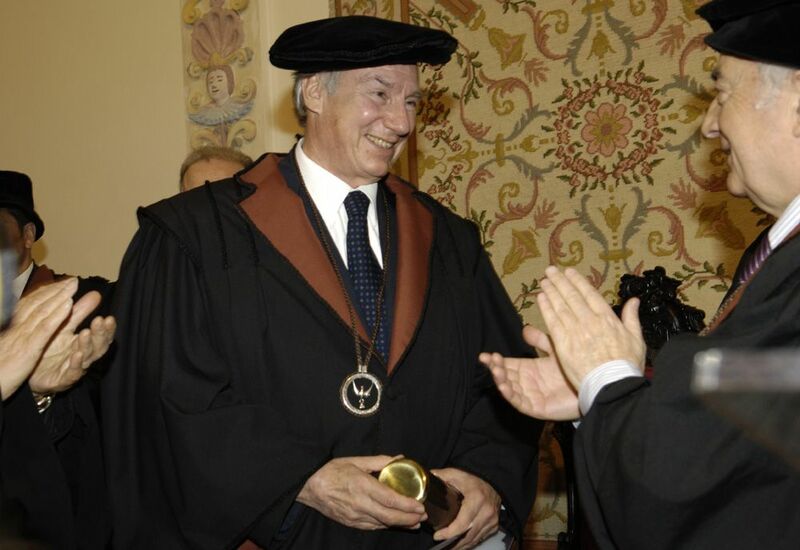 June 25, 2005: His Highness the Aga Khan receives AUB's Doctorate of Humane Letters. “I am most grateful to the American University of Beirut for this award. I accept it with much happiness and humility, cognisant of the great distinction and achievements of fellow recipients whom the University is also honouring. “Although I have never therefore been an enrolled student here, this great university has always been part of my academic horizon, where some 40 years ago, I supported the introduction of studies in Muslim civilisations and cultures through an Aga Khan Chair in that discipline. 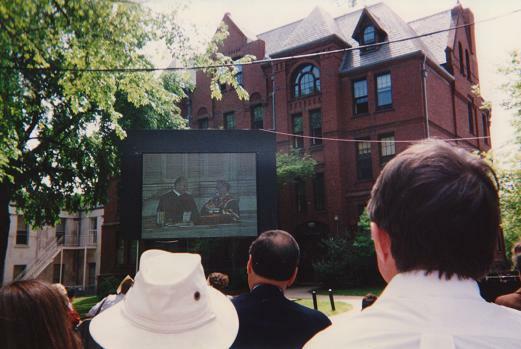 “….The University’s fidelity to its founding notion that disciplined, objective inquiry is the property of all humanity, attracts faculty and students of high calibre from dozens of countries and cultures, challenged not only to excel in their chosen fields, but to place their knowledge in the wider context of humanity’s pluralist heritage. This is a core principle of my own faith – Islam – that learning is ennobling, regardless of the geographic or cultural origin of the knowledge we acquire. “Such teachings spurred a spiritually liberated people to new waves of adventure in the realms of the spirit and the intellect, amongst whose visible symbols were the University of al-Azhar and Dar al-Ilm established by my Fatimid ancestors in Cairo, and the illustrious counterpart institutions in Baghdad, Cordova, Bukhara, Samarkand and other Muslim centres. “In the ethical realms—in the educational realm—one of the great stumbling blocks is arrogance. Even the resurgence of religious feeling—which should be such a positive force—can become a negative influence when it turns into self-righteousness. All of the world’s great religions warn against this excess—yet in the name of those same religions too many are tempted to play God themselves—rather than recognising their humility before the Divine. “A central element in a truly religious outlook, it seems to me, is the quality of personal humility—a recognition that strive as we might, we will still fall short of our ideals, that climb as we might, there will still be unexplored and mysterious peaks above us. It means recognizing our own creaturehood—and thus our human limitations. In that recognition, it seems to me, lies our best protection against false prophecies and divisive dogmatism. “A deepening sense of spiritual commitment—and the ethical framework that goes with it—will be a central requirement if we are to find our way through the minefields and the quick sands of modern life. A strengthening of religious institutions should be a vital part of this process. To be sure, freedom of religion is a critical value in a pluralistic society. But if freedom of religion deteriorates into freedom from religion—then societies will find themselves lost in a bleak and unpromising landscape—with no compass, no roadmap and no sense of ultimate direction. “Over these five decades, I have watched that world oscillate constantly, between hope and disappointment. Too often, disappointment has been the dominant story. And too often the dominant response to disappointment has been to embrace false hopes – from dogmatic socialism to romantic nationalism, from irrational tribalism to runaway individualism…. “….Another response has been to revisit past glories – contrasting them with contemporary setbacks. Many Muslims in particular, recall a time when Islamic civilizations were on the cutting edge of world progress. They dream of renewing that heritage. But they are not sure how to do so. “For some, renewal means recovering old forms of the faith – while for others it means rejecting faith itself. For some, recovering glory means opposition to the West, its cultures and its economic systems – while for others it means partnering with non-Islamic societies. “As university graduates, you will be fashioning your own visions for the future and your own ways of fulfilling them. But as you do, I hope you will honor the values of this University. For the one ingredient which holds particular promise in the search for fulfillment, is the search for knowledge. “Amid such a worthy and learned gathering I am reminded of the verses of the Holy Qur’an in which Allah reminds us that He gives the blessing of wisdom to whoever He wills, but only those with intelligence remember that He has done so. My most sincere prayer is that I, my fellow citizens of Timbuktu and my brothers and sisters in Islam can continue our journey to bring greater wisdom and understanding to all. 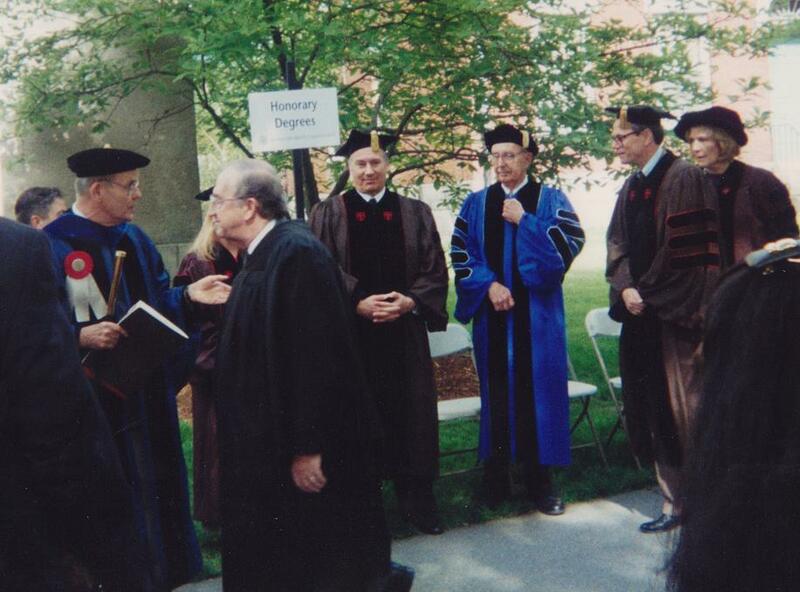 Harvard University conferred honorary doctoral degrees on 10 individuals including His Highness the Aga Khan in recognition of their outstanding achievements in a broad range of fields. Monday June 30, 2008. A portrait of His Highness the Aga Khan taken before he was honoured by the National University of Ireland (NUI), Maynooth for his work against poverty and in promoting religious understanding. Picture by: Niall Carson/PA Archive/Press Association Images. Copyright. 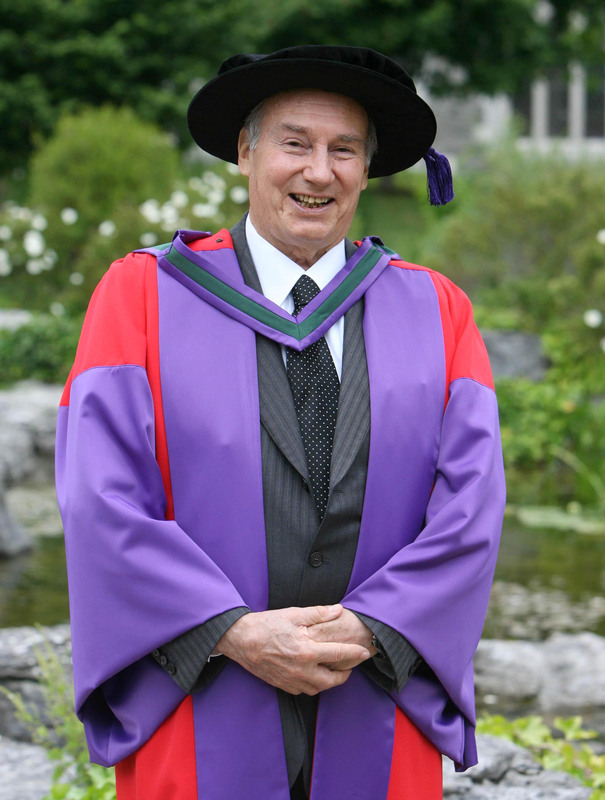 “The National University of Ireland is proud to honour the distinguished career of His Highness Prince Karim Aga Khan IV in his golden jubilee year as Imam of the Shia Imami Ismaeli Muslims. His Highness is the first member of the Islamic community to be so honoured in the history of NUI Maynooth and it is particularly fitting that this University should honour him at this time, steeped as it is in the history of Catholicism in Ireland, but now a vibrant multicultural and multi-denominational university, with students from more than 50 countries. For the Aga Khan embodies the spirit of understanding, tolerance and ecumenism that should link the great religions of the world. For fifty years, he has been a voice of moderation and a voice of reason in promoting an Islam that embraces and indeed celebrates pluralism and diversity. “…..I am delighted to welcome today the beloved daughter of His Highness, Princess Zahra. Princess Zahra, graduated from Harvard in 1994 and is the Head of the Social Welfare Department (SWD) located within the Secretariat of the Aga Khan in France. She has policy and management responsibility for the health, education, and planning and building service companies of the Aga Khan Development Network. She also plays a key policy role with respect to the other social development institutions of the Network. “The Aga Khan, a direct descendant of the Prophet Muhammed, is the son of Prince Aly Khan and Princess Tajuddawlah Aly Khan, and was born on December 13, 1936, in Geneva. 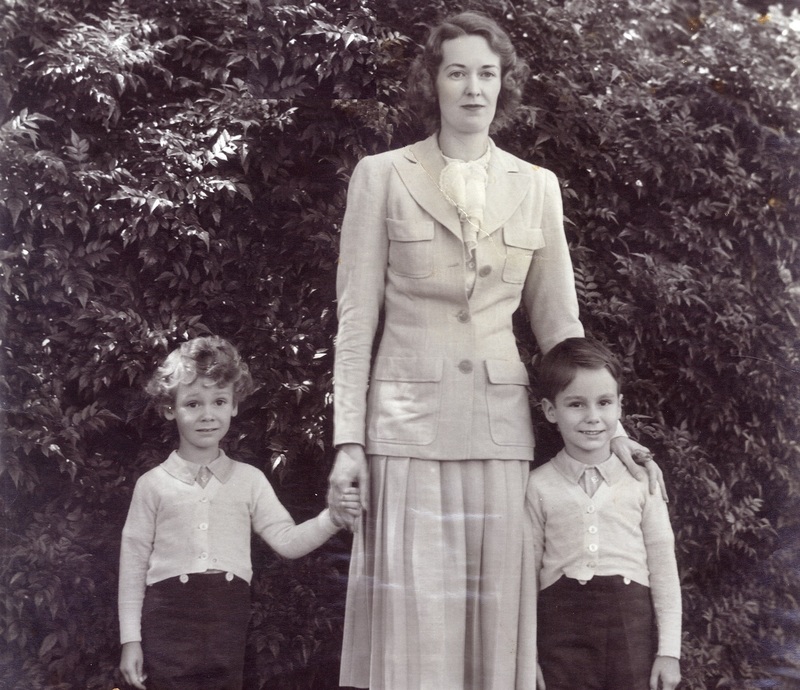 He spent his early childhood in Nairobi, Kenya, and later attended Le Rosey School in Switzerland. He graduated from Harvard University in 1959 with a BA Honours Degree in Islamic History. In 1957 he became 49th Imam (spiritual leader) of the Shia Ismaili Muslims at the age of just 20. This followed the death of his grandfather, Sir Sultan Mahomed Shah Aga Khan, who wanted to be succeeded by a young man who has been brought up in the midst of the new age, the atomic age. His grandfather, a great world statesman who was twice president of the League of Nations, and his father who was Pakistan’s Ambassador to the United Nations, recognised his intellectual gifts and his potential as a great leader. For five decades as Imam, the Aga Khan has amply fulfilled his father’s trust and his grandfather’s expectations. 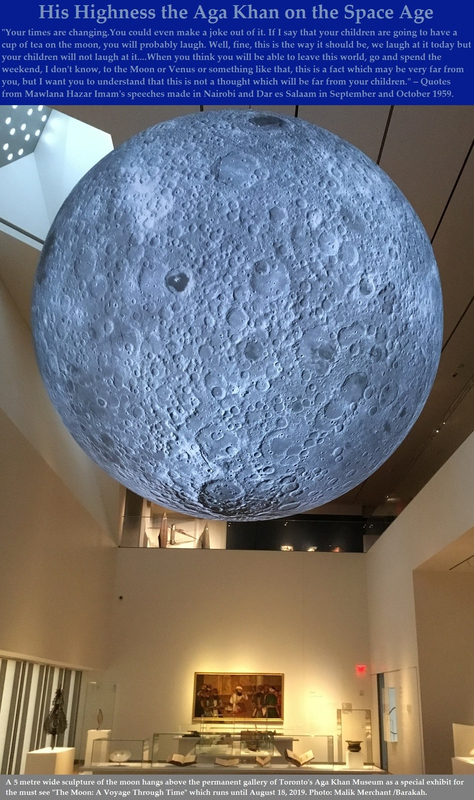 In spite of his youth, he quickly established himself firmly not only as spiritual leader, but also as an enlightened guardian of the welfare and progress of the far-flung Ismaili community. “But he has done much more than that. He has become a major activist for civilized humanity and universal values, not only in words but in deeds and not only in one location but around the world. For he believes in the long tradition of Ismaili community values – that education, self-reliance, solidarity and character are the elements that keep a community vibrant and healthy and lead to enlightenment and dignity. “His Highness is the first member of the Islamic community to be so honoured in the history of NUI Maynooth … [He] embodies the spirit of understanding, tolerance and ecumenism that should link the great religions of the world. For fifty years, he has been a voice of moderation and a voice of reason in promoting an Islam that embraces and indeed celebrates pluralism and diversity… Few people on this earth have contributed more to the promotion of tolerance than our guest of honour here today. 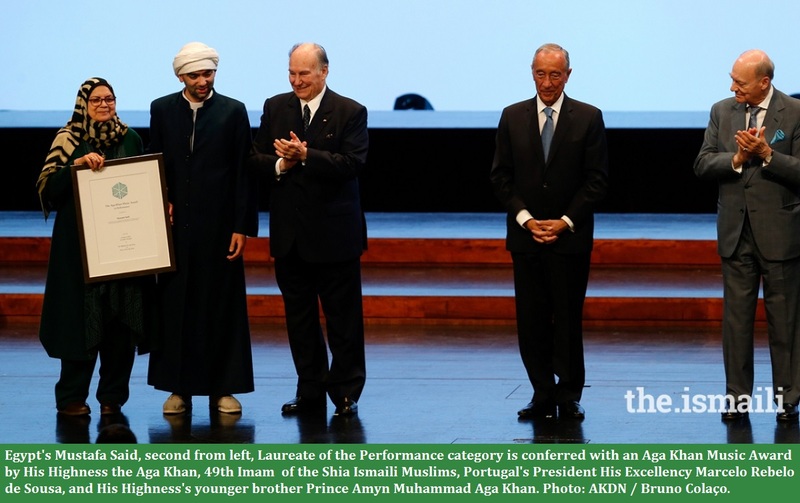 “Over the years, the Aga Khan has received numerous decorations, honorary degrees, and awards in recognition of the various dimensions of his work. He has received civilian decorations on one or more occasions from the governments of France, Portugal, Ivory Coast, Upper Volta, Madagascar, Iran, Pakistan, Italy, Senegal, Morocco, Spain, and Tajikistan. His Highness has been awarded honorary degrees by universities in Pakistan, Canada, the United Kingdom, and the United States. He has also received numerous awards and prizes from professional organizations in recognition of his work in architecture and the conservation of historic buildings. 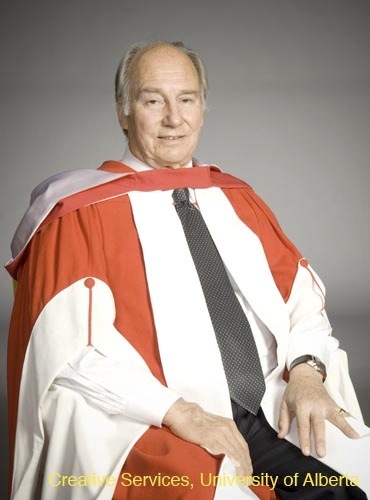 “In 2006, when accepting the Tutzing Award for his promotion of tolerance, the Aga Khan said: “societies which have grown more pluralistic in makeup, are not always growing more pluralistic in spirit. What is needed — all across the world – is a new “cosmopolitan ethic”- rooted in a strong culture of tolerance.” Few people on this earth have contributed more to the promotion of tolerance than our guest of honour here today. 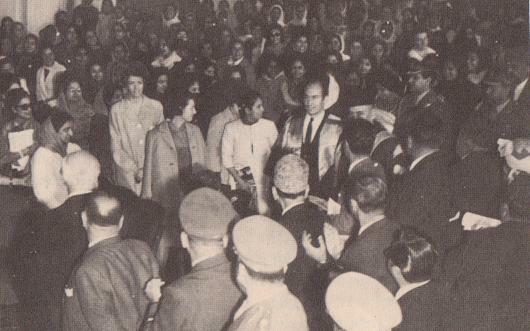 His Highness the Aga Khan (left) with his daughter Princess Zahara (right) before he was honoured by the National University of Ireland. Picture by: Niall Carson/PA Archive/Press Association Images. Copyright. “….My third theme today is ethics. Neither the political nor the civil sector can accomplish anything of value unless those who steer those institutions are motivated and directed by demanding moral standards. 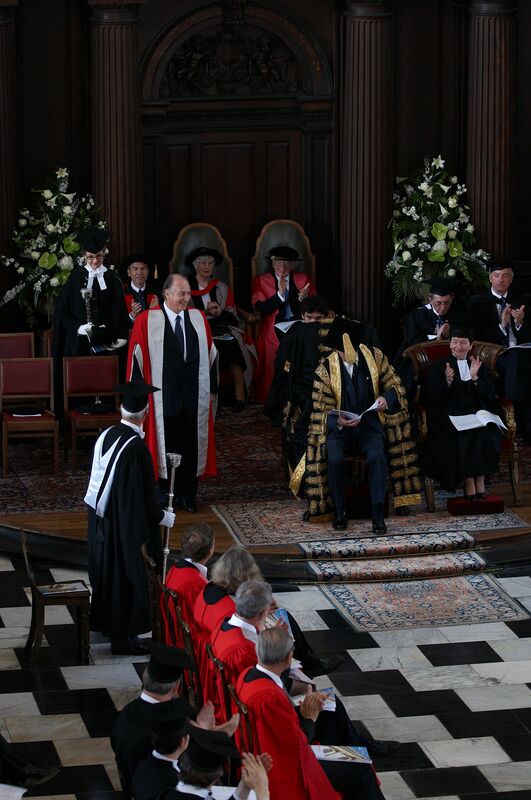 His Highness the Aga Khan was recognized with the distinction of Doctor of Divinity for his work in promoting healthcare and education in developing countries at the Cambridge University. 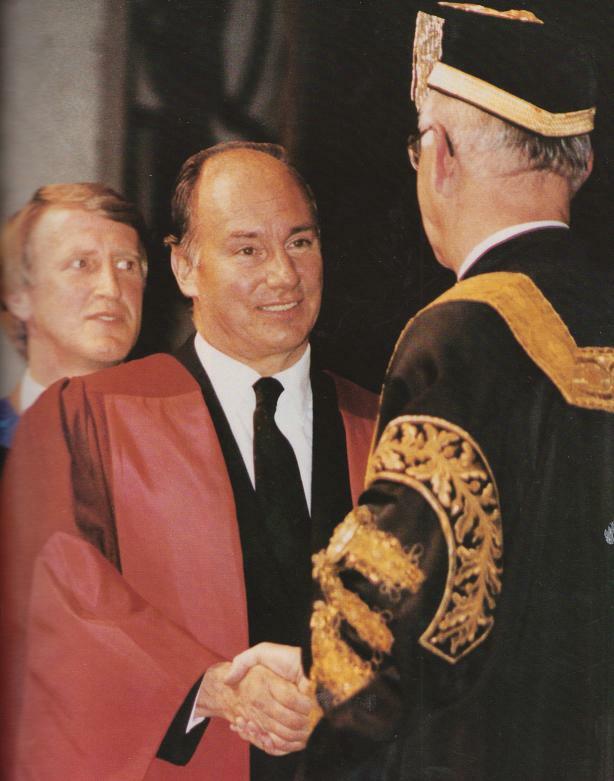 The Aga Khan became the first Muslim to receive the distinction in the University’s 800 year history. “As we celebrate our eight hundredth anniversary, it is perhaps fitting that we first honour a man who traces his ancestry to the sixth century, and to the Prophet Mohammed, peace be upon him. His Highness the Aga Khan was one of three individuals honoured with the prestigious UCSF Medal at the annual Founders Day banquet. 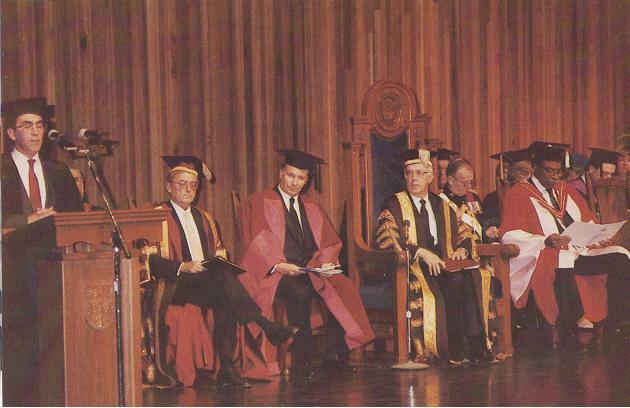 The UCSF Medal, first awarded in 1975, is the University’s equivalent of an honorary degree. While not restricted to individuals who have an association with UCSF, the award recognizes outstanding personal contributions in areas associated with the University’s fourfold mission, such as providing top-quality patient care, improving understanding of the factors that affect human health and serving the community. 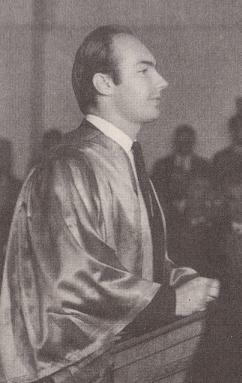 His Highness the Aga Khan received his first Honorary Degree on November 30, 1967 at the University of Peshawar, Pakistan, when he was 31. 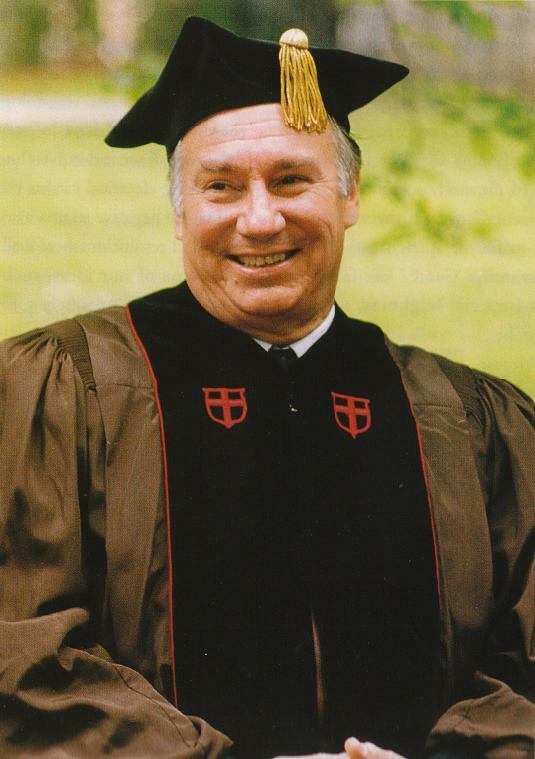 Today, January 13, 2012, he was presented with his 20th honorary degree by Ottawa University's Chancellor Huguette Labelle. His Highness celebrated his 75th birthday exactly a month ago on December 13, 2011. The President of the University, Allan Rock, observed: "His Highness has used his own faith background to speak directly to the goodness of all people." Photo: University of Ottawa. Copyright. Please click for full-size enlargement. In his welcome remarks, Allan Rock, President of the University of Ottawa, addressed the Aga Khan, saying “we see Your Highness’ presence today as a call to action for all in our university community who seek to serve humanity.” He described the Aga Khan as an exceptional man who has used his own faith background to speak directly to the goodness in all people. The degree was awarded at a special convocation, presided over by Huguette Labelle, in what was her last official event following an 18-year tenure as Chancellor of the University of Ottawa. 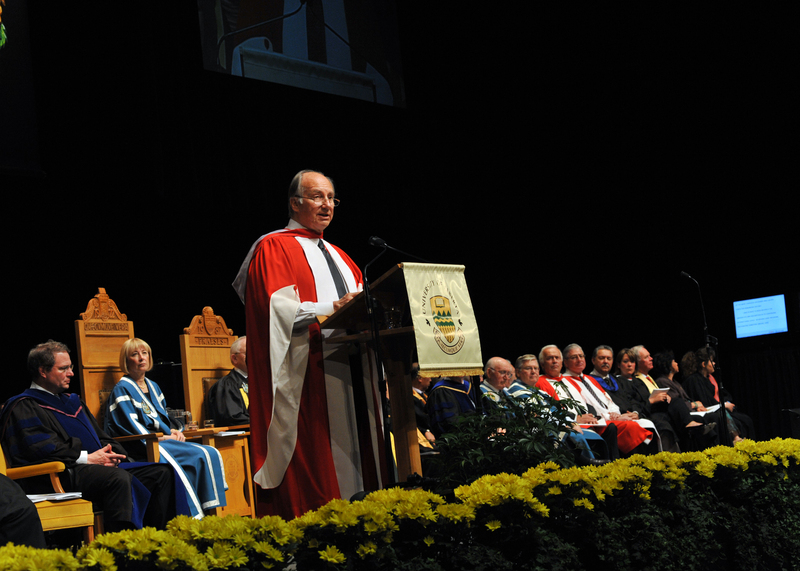 Chancellor Labelle noted “One of the privileges of being Chancellor is the opportunity to recognize individuals who have shown outstanding leadership and an exemplary commitment to service to others.” Recognizing the Aga Khan’s global achievements, she said: “His work has bettered the lives of people and communities around the world”. “There are many topics of mutual interest that I could talk about today. But I have picked just one…. I refer to the field of governance and public policy, and, specifically, to the difficulty of establishing workable constitutional systems….it seems to me that questions of constitutional governance in the developing world deserve a particularly high place on that agenda. “The so-called Arab Spring has brought special attention to this challenge – illustrating that it is easier to rally people in opposition to a particular government than to forge agreement about new governing processes. But, while this pattern has recently been more dramatically evident, it has been a reality for a very, very long time. “In my life, the two moments which contributed most dramatically to this condition were the fall of the British and French colonial empires after World War II – and then the disintegration of the Soviet Union and its Eastern European empire two decades ago. The process continues today, as developing nations re-examine – sometimes peacefully, sometimes violently – the structures under which they are governed. “In some cases and I think here of Kenya’s very new constitution – power has been diffused – in response no doubt to pressures from ethnic, economic, religious and other centrifugal forces. One risk of decentralization is that it can place more decision-making power into the hands of communities that have had less access to education and governing experience, and less exposure to national and global issues. “Perhaps this is why, in some cases, the trend has been to consolidate governing authority – such as in Afghanistan, with the aim of overcoming inertia and inefficiency – as well as – fragmented and provincial outlooks. We welcome feedback/letters from our readers. Please use the LEAVE A REPLY box which appears below. Your feedback may be edited for length and brevity, and is subject to moderation. We are unable to acknowledge unpublished letters. Please visit the Simerg Home page for links to articles posted most recently. For links to articles posted on this Web site since its launch in March 2009, please click What’s New. Sign-up for blog subscription at top right of this page. Wonderful and excellent. May Mawla bless you. I just love it….. Its a real honor for me that I was present outside the hall of Uottawa…….. Thank you Mawla Bapa for given me such a precious moment…. thanks Simerg for this information too. A nice collection of photos of His Highness. I rather enjoyed looking at the “Brown” pics taken by our very own Editor. Thank you Malik: Very well presented. A wonderful connection between educating the electorate to reach informed decisions on one hand and on the other driving them to show their brute strength and then failing the very democracy they are fighting and looking for. Malik, your presentation is always very interesting and timely. You make a wonderful collaboration of Mawla’s works. Good job. Well compiled. Excellent work done by Simerg. 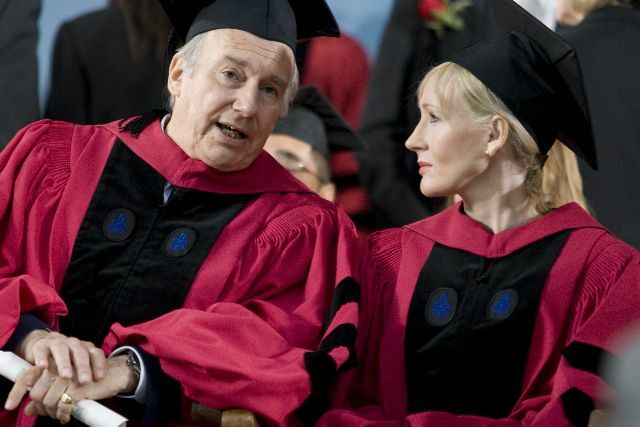 The Harvard commencement address in June 2008 was delivered by J. K. Rawling, author of the best selling Harry Potter book series. Thanks for this excellent and informative article. Super work…. Why not edit the photos taken at Browns…..they don’t fit with the rest of this otherwise concise, great reference-forward material. Thank you for your feedback. They are relevant to the event….I wonder if they are there because I took most of them! Mubaraki to our Beloved Mowla Bapa on the honor bestowed yesterday. To Simerg……………. Excellent! Thanks Simerg and to the compiler of the reading, Azeem Maherali, for putting a shining smile on me! Your articles, beautiful pictures will always be cherished!. Mubaraki. May Mowla’s grace, rehamat and peace be with you always. Just to echo what other before me have said, Well done! This record adds to an already worthwhile resource available worldwide. Thank you Malik. Simerg’s got class! All good wishes. A beautiful compilation! Bravo Simerg and kudos to the compiler Azeem Maherali. Mubaraki to our Mowla bapa for the honor bestowed by UO for his tireless work to help all the people around the world. We are certainly very proud of his achievements ever since he became our 49th Imam. Our Ismaili Community are very fortunate to have Hazar Imam as our leader. The Synopsis outlining the the different Doctorate Degrees that Khudhavind has received is simply sensational and educational. In such a fast faced dynamic changing society the Imam shows us no matter how busy he is he is always working for the Global Jamat all the time and assisting the less fortunate. I am so happy and proud of our Imam for the extensive amount of time and dedication and institutional and Jamati progress our Imam has made for us during his current terms of office as the Imam. Mowla thanks for being our guiding light and Simerg and Mr Merchant this site will be cherished by many many generations ahead. Keep up the magnificient work!! Thank you Mr. Abdulmalik Merchant and Simerg for showing the long Road 1967 to 2012 from atound the world covering four continents of the world. From Peshawer Pakistan to Ottawa Canada. From University of Sankoré Mali to Osh State University, Kyrgyzstan. Terrific Simerg…nicely done. A well compiled piece that will need to be read carefully because His Highness’s words have much foresight and wisdom. Very nice. Excellent work. Thank you.